Early December 2012 Husband Walter, his mother and I traveled to visit Grandma Sugar’s youngest sister and her family in Kentucky. On trip included a number of stops along the way. One was a night with our oldest son Walt and his family in Marietta, Georgia. Dec. 6, the morning we were to resume our journey, marked a year since my mother passed away at age 92. My day was filled with good memories and special people who shared memories of my mother. That morning as our three oldest Georgia grands wrapped up preparations for catching their school bus, daughter-in-law Sarah and I sat at her kitchen table. Conversation with my lovely and lively daughters-in-law is always a treat and today the conversation Sarah and I shared included reminiscing about Mother. What a blessing to have two special women with me on this day—Sarah and Grandma Sugar. My mother-in-law had never before visited Walt’s family since they had moved to Georgia. Sarah gave her the grand tour of their new home before we left for our next destination--Gatlinburg, Tennessee. A surprise awaited on a chest of drawers in Sarah’s walk-in closet. 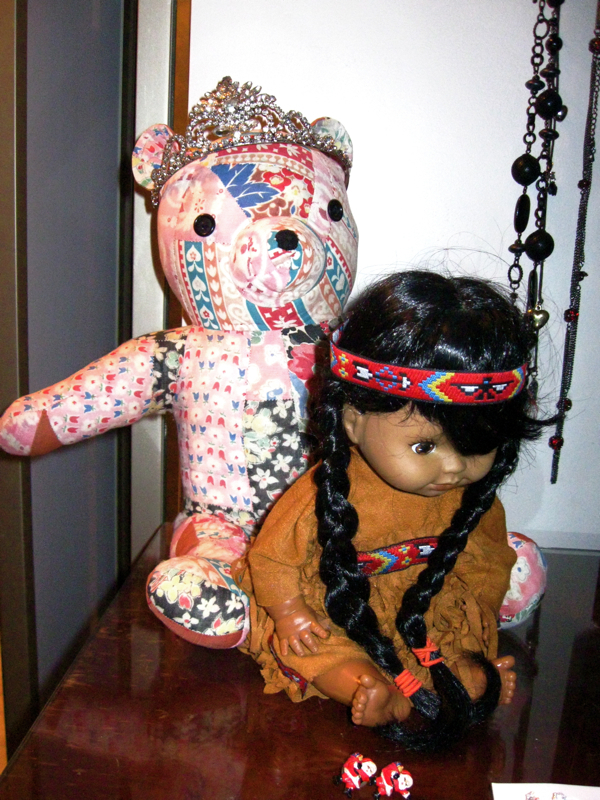 A stuffed bear and a beautiful little Indian doll greeted us. Both were reminders of love in action. The bear combined the skills of two women who never met each other but who both loved my mother. My mother’s own mother made the quilt that supplied the raw material for the bear. The patchwork quilt included scraps from the once colorful material that she had used to sew dresses for her daughters. Decades later, a rambunctious and aerially precocious puppy shredded a large section of the quilt Mother had hung outside on a clothesline. My sister-in-law Lila, who had become well acquainted with Mother, turned what remained of the quilt into stuffed bears for Mother, my brother, me and our children. The doll keeping the bear company was a creative work of love for Sarah by her mother. A little five-year-old Sarah had developed a fascination about Native Americans. For Christmas, no Native Amercan doll was to be found. Sarah’s mom did find a beautiful little African American doll. This determined mom created the iconic fringed attire and long braided hairstyle. Sarah still cherishes her mother’s gift. Oh, and the tiara the bear is wearing is Sarah’s from her reign as high school homecoming queen. Later that day, I visited by phone with Mike, my brother and only sibling. Mother would have relished our conversation. Mike caught me up on the latest travel adventures he and my sister-in-law Sonya are planning with their two college-aged daughters Amanda and Becky and their son Matthew after Matthew’s high school graduation in May. One other thing: Mother’s departure from this life on Dec. 6 added another date to a string of consecutive and significant December dates. My father had received his draft notice earlier in 1941, and the couple had planned a simple wedding for Christmas Day. Then the Pearl Harbor attack occurred on Dec. 7. His notice to report for duty arrived on Dec. 8, and he and my mom moved their wedding ceremony to Dec. 9. I am thankful for the blessings and comfort in many forms that filled the first anniversary of Mother's death: people, shared memories, a phone call, even a bear and a doll. This was so neat to read. I love how these reminders of the stories from the past that connected you, your mother and others came about by seeing these tangible precious items. An amazing and wonderful story. I hope these things are loved tenderly and never leave the family. a lovely memory, a lovely story and I really like that doll. when i was a child, all the way through highs school, i loved all things western and Indian...our school was Jenkins Warriors... she did a fantastic job with the doll and also the bears. 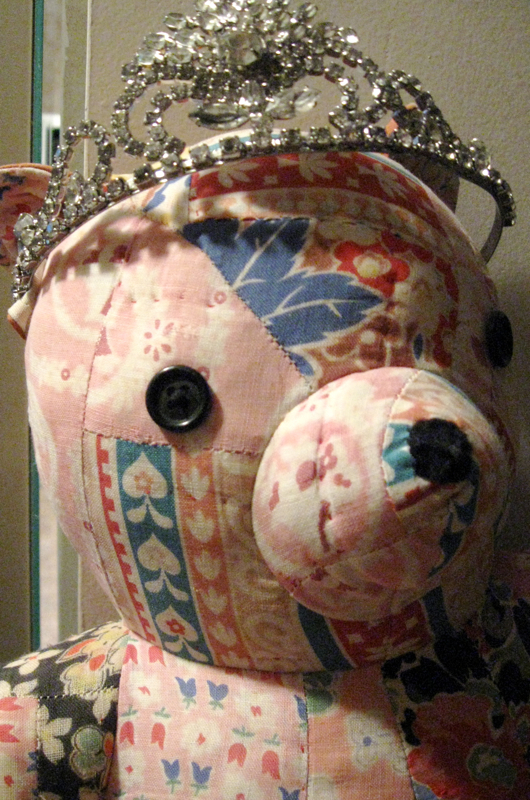 What a wonderful and amazing story all wove together with fabric that was once a quilt, and now a bear to be held in memory of those loved ones who have preceded us. Beautiful memories. I love treasures both tangible and just in our hearts. I'm so glad you could be with family and share together. Great repurposing of the quilt into bears and such a delightful Native American doll. What a lovely visit made more by love from the past. Hugs. I don't have anything from my ancestors sitting in my home. Sad. What a wonderful post. The memories and the love in the stories are beautiful. Such anniversaries are often difficult, so I'm glad you wrapped yourself in such lovely thoughts and conversations for the day. Hang on to the happiness.